Looking for a night out with your significant other or to celebrate a special occasion? Bellevue's own John Howie Steak has you covered. The downtown Bellevue steakhouse has created a unique prix-fixe menu that showcases the ingredients and skill behind every dish. Only 5 months old, this menu introduces guests to different cuts, age statements and breeds of beef with steak choices ranging from USDA Prime to American, Australian and Japanese Wagyu. Guests start off choosing from French Onion Soup, Caesar Salad and Organic Heirloom Tomatoes. 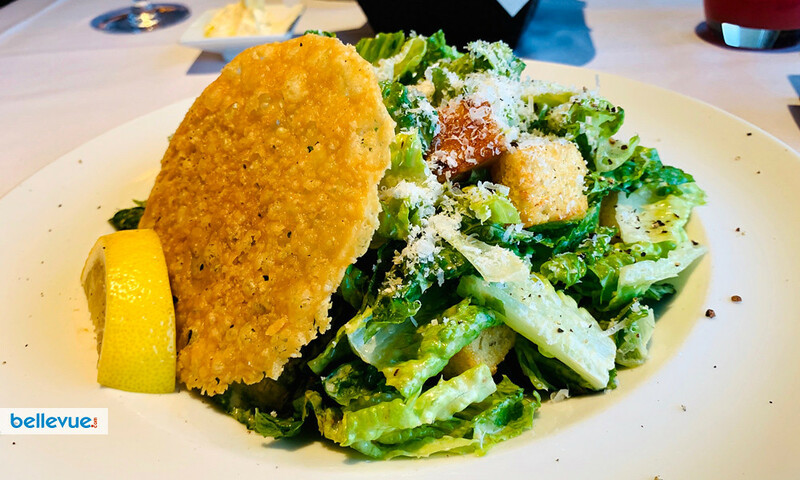 I went with the classic Caesar salad with romaine hearts, garlic croutons, Reggiano Parmigiano and lemon-anchovy Caesar dressing. 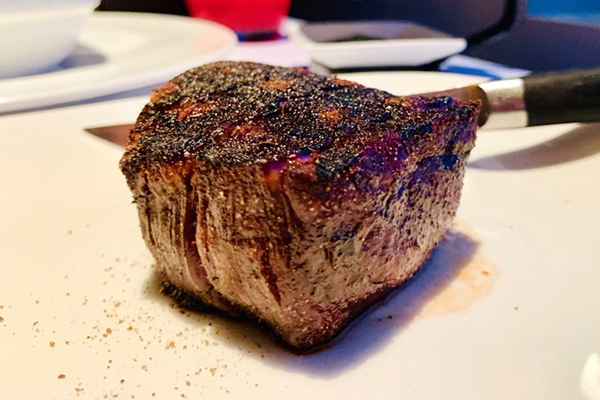 Moving on to the entrée, the selection of steaks is almost overwhelming with cuts from the US, Australia and Japan and names ranging from Filet Mignon, Rib Cab, Sirloin, Zabuton and more. 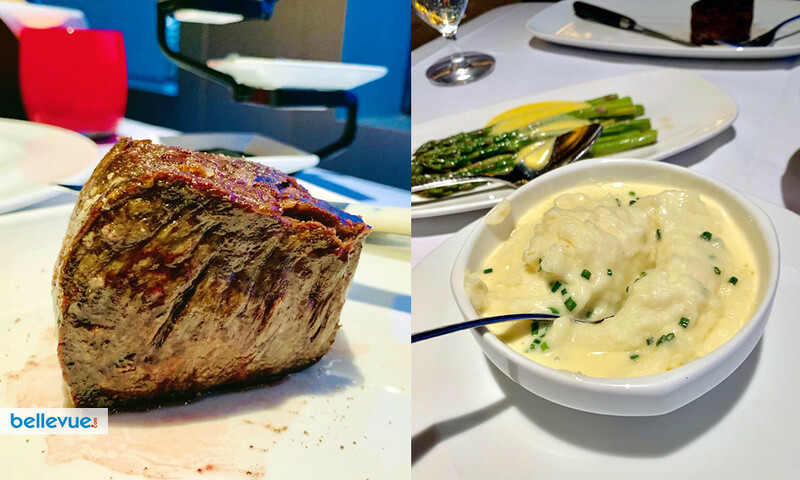 My American Wagyu Filet Mignon was perfectly cooked and seasoned, and served family-style with velvet smooth mash potatoes and delicious asparagus. 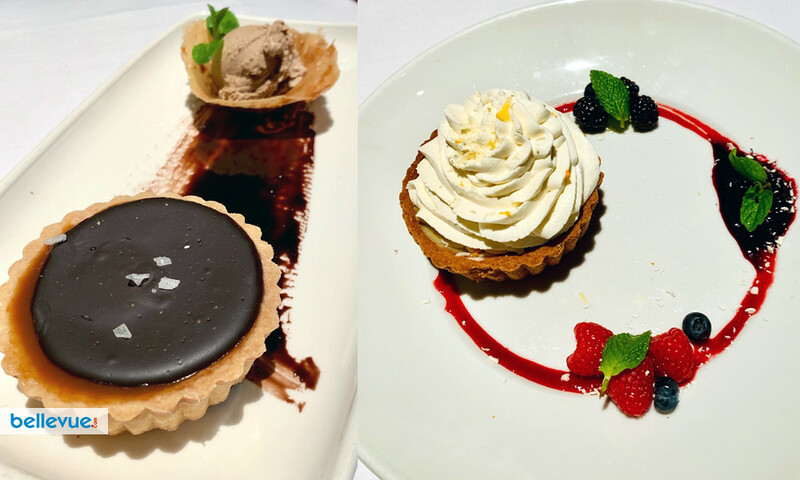 To complete the meal, I had the wonderful options of Salted Caramel & Chocolate Ganache Tart, Meyer Lemon Pie and Grand Marnier Cream Brulee. As a chocolate lover, I went with the Salted Caramel & Chocolate Ganache Tart, but also got to try the Meyer Lemon Pie. Both are beautifully presented and end things on a high note. You really can't go wrong ordering either dessert. 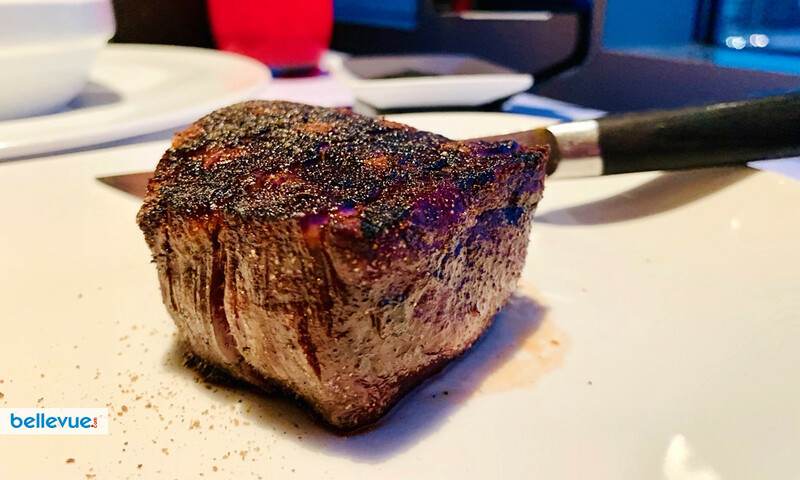 The team at John Howie Steak does a great job making sure the little things are covered as well to raise the bar on the overall dining experience. 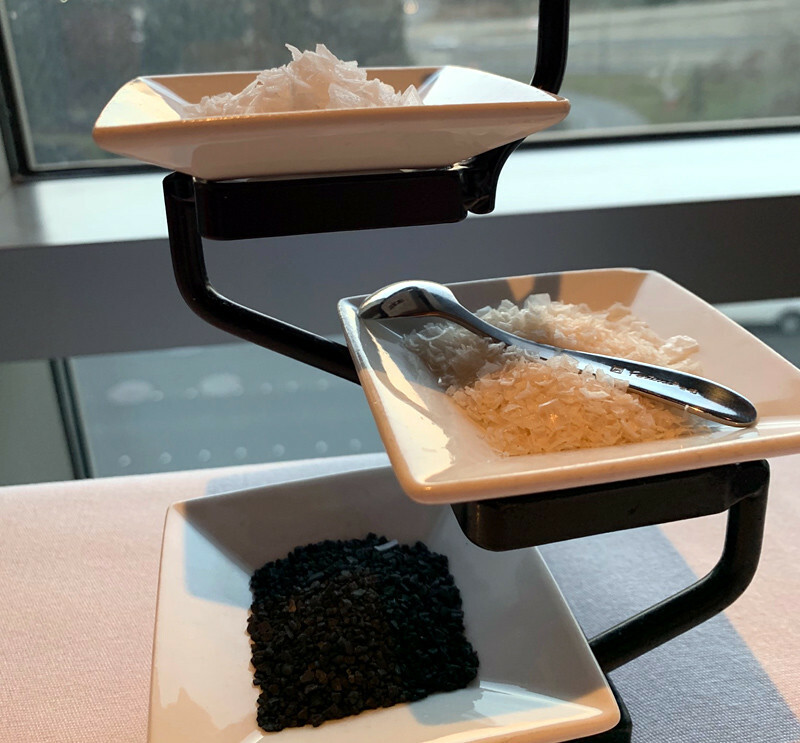 One of those surprisingly wonderful items are the three kinds of specialty salts they provide to enhance the flavor of their steaks ranging from the Portuguese White Flor de Sal to Australian Murray River to Hiwa Kai Black Lava, each one leaving its own unique flavor when added. Another finer detail is when the waiter comes by--before your food is served--with a wood case carrying multiple options for a high-end steak knife to choose from. You get to pick from the La Cote steak knife (Canadian), the Tyrellex steak knife (Chinese), the Shun steak knife (Japanese) and the Opinal Inox and Laguiole steak knives (both French). Having all these options brought to your table is a great ramp up to the main course. Overall the prix-fixe menu is a great way to try all that John Howie Steak has to offer. From start to finish, each course was delicious and filling. To keep things fresh, the menu does change every few weeks so this menu will always have something new to offer. So, check out this version of the prix-fixe menu before its too late.